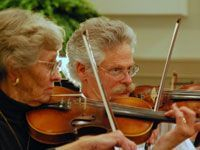 The Tehachapi Symphony Orchestra is truly a community orchestra composed of talented musicians from the Tehachapi and surrounding areas, with special guest appearances by musicians from around the world. Our goal is to provide top notched entertainment for the enjoyment and enrichment of the community. Concerts are free of charge to all attendees who wish to experience live classical music. The orchestra has inspired hundreds of children and adults alike to pursue the study of a musical instrument and for many, the Tehachapi Symphony Orchestra has been a first time exposure to classical music. Studies have shown that participating in classical music either by listening, watching, or playing improves high-level cognitive skills. Many of our current orchestra performers began their musical careers by first attending a Tehachapi Symphony Orchestra concert. Orchestra members donate their own time to rehearse and perform for the community; however it takes a substantial amount of money to orchestrate these free concerts. The orchestra's budget is about $40,000 per season. Money is needed to pay our conductor, hire first-class soloists, fill vacant instrumental chairs, obtain sheet music, and rent rehearsal and performance sites. K Club Member - Those who donate $1000 or more to the orchestra in one season will receive: reserved front row seating for all indoor concerts, an embroidered orchestra logo polo shirt, recognition in all concert programs, and a special invitation to a private event. Donors of $25 or more will have their names recognized in each concert program during the entire season. A thank you card from our treasurer will be sent to you noting your contribution for tax purposes. All donations are tax deductible as the orchestra is a 501c(3) organization. For your convenience, you can make your donation by PayPal by following the Donate icon below.